Sleeping outdoors can be uncomfortable without a suitable sleeping gear. Poorly chosen beds lead to exhausting sleeps; therefore, it is essential to consider different factors when shopping for one. Here is the list of most comfortable camping beds for outdoor use, you will find 6 items that I believe the best in the market. The Coleman QueenCot is a perfect solution for those who want to make the best out of their investment. This product is designed to deliver utmost comfort and convenience. It features a portable and robust frame that keep the mattress 22 inches off the ground just like a normal bed. This way, the air mattress ensures your safety from the cold ground and also insects in the surrounding. The supporting frame also gives you a feeling that you are sleeping on your bed at home. It also helps remove backaches or knee pain caused by sleeping on conventional sleeping air pads. As a result, the Coleman QueenCot is suitable for people in their mid 50s or above. If your parents want to find a great air mattress for outdoor camping, suggest them to buy this item. Furthermore, the Coleman offers a thin cotton sleeve covering the cot to eliminate any noises during sleep. The frame is collapsible so that you can carry it around with ease. The company put a lot of effort into maximizing your comfort sleeping on their air mattress. They even provide users with side tables for you to hang personal items such as books, phones or drinks. This feature reminds me of a real bed with an additional small table beside. What a luxury to sleep on the same bed outdoors. One good thing is that you don’t have to waste your breath to inflate the air mattress. This item is self-inflating thanks to the 4D battery-operated pump. Batteries are not included in the package. 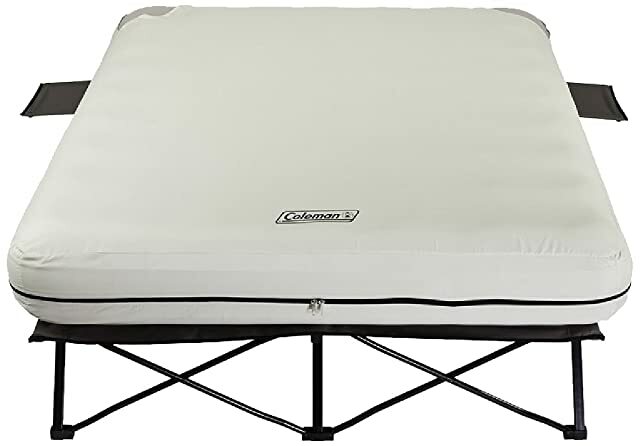 With its durable frame and ComfortStrong coil construction, the Coleman QueenCot can support up to 600 pounds of weight. That means it can hold two people at the same time, just like any regular bed. If you want space, this cot is undoubtedly provided plenty of room for one person to turn and toss around. Coleman QueenCot also provides users with exclusive cutting-edge technology. The cot offers Double Lock™ valve that increases the capacity to keep air. What’s more, AirTight® system prevents possible air leakage. The 4D pump makes inflation and deflation easier. You have to buy the batteries separately though. Unfortunately, there are some drawbacks. 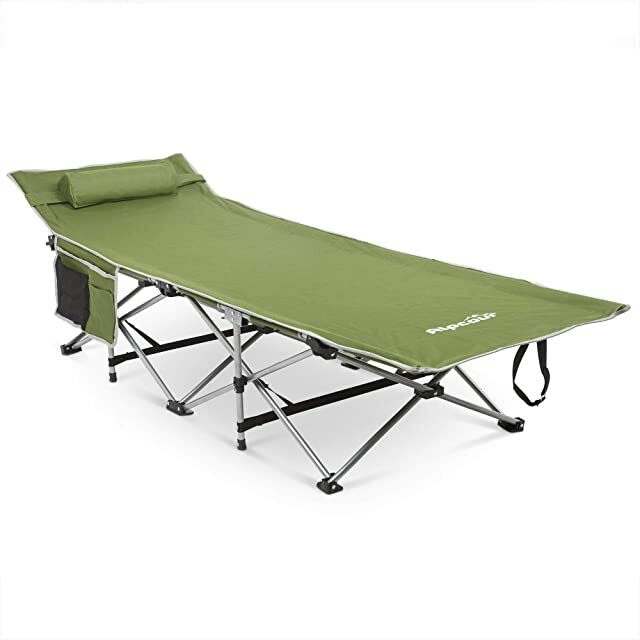 The Coleman QueenCot is not suitable for camping trips on foot since it’s quite heavy. Some people complain that the 4D pump does not always function as expected. The Coleman QueenCot is a product of value for those who are looking for a comfortable bed to sleep on overnight. When it comes to comfort and durability, the Etekcity Camping Air Mattress is my number one choice. This product is made of non –toxic hard-wearing PVC. This material is famous for its high quality and ability to resist puncture and water. So if you are looking for a mattress that you can use for years, this is it. Plus, the Etekcity Camping Air Mattress offers a comfortable flocking top to maximize your comfort during the night. It even adds a skid-free bottom to prevent the bed from sliding off the ground. This air mattress is constructed with quality material build to increase the comfort. Plus it features seamless welding to keep air in and prevent air leakage. The vinyl is roughly 0.35 millimeters, which provides both comfort and stability. When fully inflated, it stands 9 inches off the ground. No cold air from the ground can disturb your sleep now. Etekcity offers a rechargeable pump that makes the inflating and deflating process is as easy as ever. There are 2 charging options for your convenience. You can either charge the pump with an electric outlet or with your car when you’re on the go. Once deflated, the bag is very compact and does not require too much space. You can easily store it in a travel-ready bag. The twin size product can support 450 lbs of weight, while the queen size can hold up to 650 pounds. That means this air mattress is a perfect choice for camping couples. Compared to other air mattresses, the Etekcity Camping Air Mattress comes at a great price, making it one of the most affordable products on the list. Another plus for this product is that the inflating and deflating process is not time-consuming at all. There are quite some complaints about air leakage of this item. I believe it could be due to the tendency to expand and stretch of PVC; it makes you feel like the mattress is out of air. 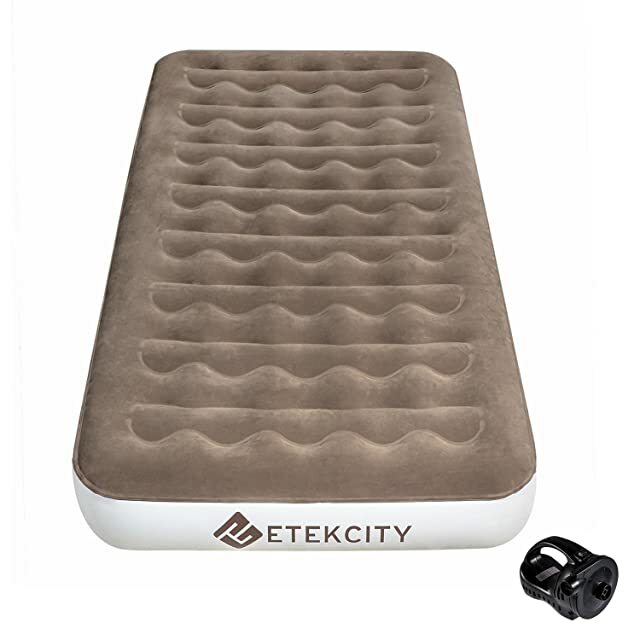 The Etekcity Camping Air Mattress is undoubtedly your most trusted companion for nights of sleep in the open air. Easy to get in and out thanks to the 20 inches height. The King Koil is an excellent product for camping trips thanks to its design and features. When fully inflated, this air mattress can be as thick as 20 inches which makes it easy to get in and out without straining your legs and joints. It isolates you entirely from the moisture and coldness of the ground. What seems incredible to me is that it only takes up to 4 minutes to inflate. To inflate the mattress, you need to locate the pump and close the safety valve. The rest is easy. You need to plug in the bed and wait for it to fill with air. The problem is the built-in pump can only be used with an electrical outlet. This King Koil QUEEN SIZE needs another external pump to inflate properly when it isn’t near a power source. You have to buy this pump separately. Does your back problem stop you from enjoying the outdoors? With the King Koil Air Mattress, this problem is will eliminated. The International Chiropractors Association has recommended this product for people with spinal problems. It also helps to align your spinal properly when sleeping. The quilt top of this item is my favorite. It is thick and water-resistant. The mattress also offers bottom grip to keep it immobile on the floor. When it comes to comfort, the King Koil is top-notch. Thanks to the coil technology, this item can maintain its firmness and minimize air leakage, so that you will feel like you are sleeping on a real bed. The side flock is another useful feature that keeps the mattress away from puncture. The maximum capacity of this product is up to 600 pounds, which is both useful for individual and couple sleeps. Or External pump for camping trips. 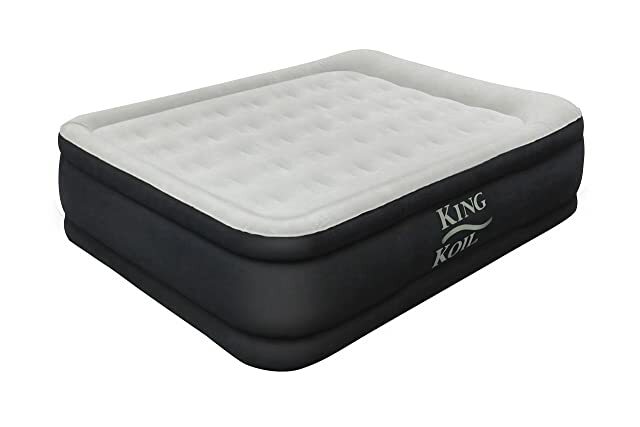 The King Koil is an excellent investment for camping enthusiasts who love to spend nights with a thick, well-insulated and comfortable air mattress. If you are looking for an affordable air mattress for occasional camping trips, the Langria Upgraded Twin Size Air Bed is an excellent match. When fully inflated, it can stand 8.5 inches above the ground. Not as impressive as the two items above; however this air bed still makes you feel at ease when getting in or out. It supports 300 lbs of weight, which is suitable for two kids or one adult.The Langria Upgraded Twin Size Air Bed is constructed of flocked PVC. Its resistance to water and damage greatly enhance the durability of the product. Plus, the 32 circular coils help support the body weight and distribute it throughout, delivering utmost comfort for users. The PVC-made, anti-skid bottom also keeps the air bed firmly on the ground and resists puncture. One added feature that I find extremely useful is the air pump with two cables. You can charge the pump via conventional power outlet or through a car cigarette lighter. This way, filling up the air bed is no longer a daunting task, especially when you travel by car. The dual safety valve secures the air inside. What’s more, the seamless welding also prevents potential air leakage. When putting together, these features guarantee comfortable periods of sleep without worrying about topping it up during the night. The Langria Upgraded Twin Size Air Bed is considerably lightweight. It only takes 2 minutes to inflate and deflate the air bed. You can easily fold up and store it in the carry bag. I don’t have any problem with the pump; however, I read a couple of reviews that said it dies after a few uses. I don’t think this is a manufacturing deficiency, but it does raise some concerns. 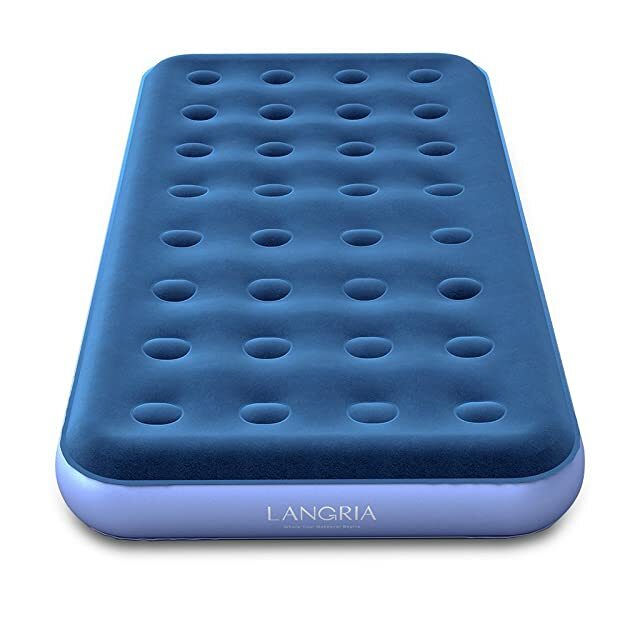 The Langria Upgraded Twin Size Air Bed undoubtedly an excellent buy for users on a tight budget. It is compatible with both outdoor and indoor use. When it comes to comfortable camping cots, nothing can beat the Teton Sports Outfitter XXL Camping Cot so far regarding space and durability. 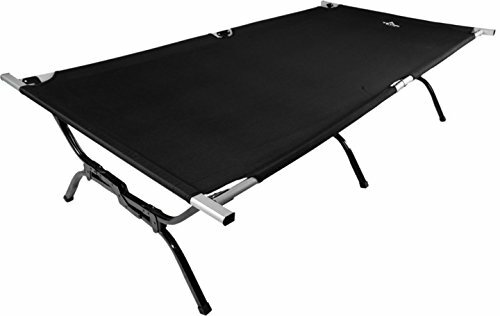 This camping cot can hold up to 600 lbs, as much as a good air bed. It provides enough space for two kids or one adult. But how could a cot be that strong? The Teton Sports Outfitter XXL is certainly built to last. The frame is made of aluminum while supporting legs are of steel. Aluminum is famous for their lightweight and corrosion resistance, and steel is very durable and flexible. What’s more, the S-shaped supporting structure enhances the bearing capacity. I also rate the comfort it delivers high. The big size helps you turn and toss around with ease. Teton adopts 600D Poly/Canvas Poly Canvas for the top fabric. 600D Poly/Canvas Poly Canvas has long been famous for its bearing capacity. This fabric is heavy-duty and breathable. It is also water-resistant and soft. Together with the hard-wearing fabric and durable frame, it is no doubt why this cot can support 600 lbs of weight. The sturdy frame also allows staying away from the cold ground and insects. I have to say not many camping cots in the market can offer that much of space. When you sleep alone, it is similar to a king-size bed. This item is not the lightest in the market, but it is very much portable. Of course, those who go hiking and camping would not want to carry a 26-lbs cot along. This product is more suitable for car camping. If you are looking for a durable and versatile product for camping trips in summer, the Teton Sports Outfitter XXL Air Bed is my recommendation. The Alpcour Folding Camping Cot put a lot of effort into making its users feeling at home. This product features an exclusive pillow. Together with the head-inclined feature, it makes falling asleep in the wildness as easy as ever. The 600D Polyester double-layer fabric is durable and strong. It can support up to 300 lbs of weight. Plus, this material is highly breathable and skin-friendly. What’s more, the Alpcour Folding Camping Cot adopts steel brackets and triangle structure to support the weight. It is also easy to set up and fold down. This camping cot features a side bag for you to keep valuable things such as mobile, wallet or earphones. When fully set up, the Alpcour stands 17 inches above the ground. It keeps you away from the moisture, bugs and anything else on the ground. As you can see, this sleeping cot seems to fit with summer use only. Those who want to benefit from its exclusive comfort in autumn or winter camping should use it with insulated pads. This cot comes with a carry bag for storing. Due to its maximum capacity and dimensions, I do not recommend it for exceptionally tall and heavy users. The Alpcour Folding Camping Cot is an excellent investment for those who aim at a durable and comfortable outdoor sleeping gear. How do you sleep comfortably while camping? There are thousands of different outdoor sleeping gears out there, from sleeping pads, sleeping bags to cots and mattresses. They all have the same purpose: to provide you with utmost comfort when sleeping in the wildness. That’s said, sleeping restfully while camping can be challenging even if you own the best sleeping supply. So how to hack a good night sleep outdoors? Even if you are not a noise conscious person, camping outdoors could sometimes be too loud that it’s hard to fall asleep. My advice is to choose a quiet campsite and keep the noise level at the minimum. The location to pitch your tent is essential too. You don’t want to spend a night on the lumpy ground, do you? The rule of thumb is to always look for soft, plat grounds to settle down. Yes, it’s about your sleeping gears. How much bed cushioning you need is the key to unlock a comfortable night sleep. If one sleeping bag isn’t enough, consider things like air mattresses or sleeping pads. If you camp during winter or when the temperature is low, it is crucial to warm your sleeping gears first before diving in. I often put a hot water bottle in my sleep bag and let it stay there for half an hour before sleep. Summer camping can be a disaster with mosquitos. Don’t forget to bring your mosquitos net with you with you want to sleep under the stars. Why does my air bed deflate overnight? Three factors cause air mattress to lose air overnight: the design, temperature, and pressure. Once you sit on the air bed, it has already lost a small amount of air. As a result, you will encounter deflation more frequently overnight than during the day when the temperature is higher. How do you fix a hole in an air mattress with duct tape? Does your air mattress have a hole? It can be easily fixed with duct tape with this simple instruction. Apply epoxy glue or rubber cement to the hole and wait for it to dry. Apply several layers of duct tape at 45-degree angles to ensure the hole is covered. Inflate the bed and check if it works. Regardless of whether you are a camping master or just a newbie, a good night sleep is crucial. Therefore, shopping for a camping mattress requires lots of information and evaluation. I hope that the list of most comfortable camping beds for outdoor use has brought you favorable choices for your upcoming trips.